I was only a little girl when my Grammy had me kneel before her in their little church. She anointed my forehead with oil, and laid her hands on me. I was sick, but I can’t remember what for. She prayed very quietly, and everyone believed I was healed. And healed I was. In Christian circles the magic of healing comes from God himself. Faith healers consider themselves only to be the conduit through which the omnipotent power of the Creator is channeled. The patient must believe in this power. Otherwise the gift of wellness is not bestowed. Secular magic on the other hand calls upon natural and universal agents to impart the cure. Conditions are set, such as times and places that are propitious for healing. Disease may be transferred from a person to an inert object such as a potato, and then buried. In either case a ritual is consciously or unconsciously devised, and it’s not so much the charm or formula uttered that counts, but rather the strength of a person’s faith in the unseen power that heals him. Infections, injuries, or chronic health problems were as common then as now. The difference is that today we have ready access to medical evaluation and antibiotics for the treatment of potentially life-threatening cases such as necrosis, i.e. when body cells in a localized area begin to die off. In yesteryear a Pennsylvania Dutchman, when confronted with a similar situation—perhaps an infection that was about to turn gangrenous—might have sought self-treatment with this remedy, efficacious for both man and beast: Schwarzes Brandpulver zu machen | How to Make Black Powder [to Cure Necrosis]. 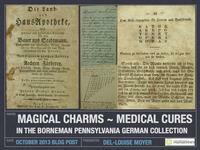 He/she might have copied it from page 102 of the first charm book Die Land-und Haus-Apotheke known to have been published by Johann Georg Hohman in Reading, Pennsylvania in 1818. The following is an exceptional and worthy powder to cure necrosis [kalten Brand] in people as well as animals, and to prevent it in external wounds. To make this powder take two ounces of the best gun powder, one ounce of alum, and one ounce sulfur. Pulverize, and make sure the ingredients are well mixed together. The concoction is now ready to use in the following manner: If a person has cellulitis (inflammation of any of the tissues of the body, characterized by fever, pain, swelling, and redness of the affected area), or a fresh wound where it is feared that it may become necrotic, take a teaspoon full of this powder and add it to a gill (1/4 pint) of good vinegar, and mix well. Use this solution to wash the wound as a preventative measure. Where the skin has already become necrotic, one should use the above described solution three times daily, and continue to do so. For a horse or another animal, take a tablespoon full in a pint of good vinegar, and follow the instructions already given for curing people. Washing the wounds twice daily in the solution will totally prevent inflammation, tumors, or unnatural growth such as granulated flesh, also known as proud flesh or caro luxurians. N. B. White powder to cure dying flesh is made and used exactly like the black powder except that one will use a lot of saltpeter instead of gun powder. 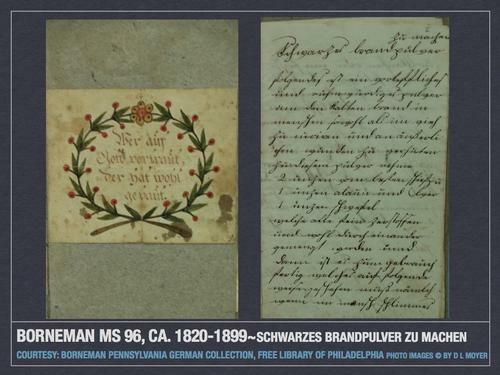 In 1820 Homan had his second charm book Der Lange Verborgene Freund or The Long Hidden Friend printed in Reading by Carl Bruckmann. Since more than six hundred people in southeastern Pennsylvania had subscribed to his 1818 publication, his name was now known. Like any good salesman, he decided for his 1820 imprint to use testimonials of people he claims his wife or he had helped or cured. Used Remedies for Them Out of This Book. Johann Bingeman from Ruscombmanor Township in Berks County has a son, who burned himself badly. My wife came to them in the latter part of the year 1812. He already had flesh that was dying. My wife used remedies for it, and the necrosis soon ceased. The boy recuperated, and healed. At the same time my wife cured his wife of a strong case of erysipelas [Rothlauf ] on her sore leg. Please be sure to visit our Facebook gallery for more images pertaining to Borneman Ms. 98. In the 1970s and 1980s I would attend Institute [workshops/lectures] at the Landis Valley Farm Museum in Lancaster. On one occasion I had signed up for a lecture on Powwowing. Following the lecture a woman from the Lancaster area mentioned that she had acquired several "witch" balls of varying sizes which were wrapped in colored string forming star-like designs, as I recall. She felt they would make interesting decorating accents and grouped a few on the fireplace mantel and others on an end table. A few days later she realized that some of them had moved. So, she arranged them again as they first were. Again, she noticed that they had moved. I do not know how these "witch" balls had been assembled, but it has occurred to me that possibly they have a magnet in the center, and that not all the magnets have the same polarity--some would pull toward each other, and others would push away [positive or negative?]. Another attendee, again from the Lancaster area, spoke of a man who could stop a person's bleeding. He recounted an incident when the doctor's at a local hospital could not stop the bleeding of an accident victim. The family members of the victim requested assistance from the hands-on "healer" who was successful. It often has been said that in these incidences the person receiving the treatment needs to believe and trust that the "healer" has the power and gift to remedy the problem. Thanks Sandra for sharing both stories. Possibly the witch balls did have magnets in the center, or possibly they didn't. Do you know how they were originally intended to be used? Re Healers who can stop bleeding...I have heard similar cases as the one you've related. 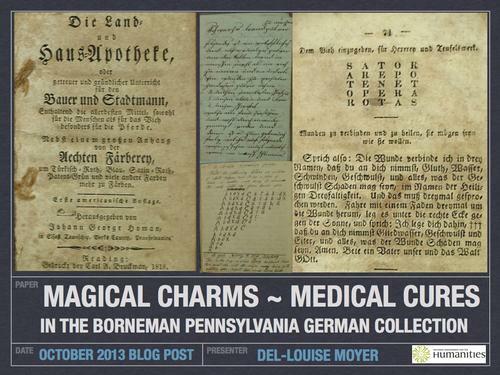 David Kriebel in his book "Powwowing Among the Pennsylvania Dutch: A Traditional Medical Practice in the Modern World (Pennsylvania German History and Culture)" has some interesting stories to relate.